For cat guardians and anybody wanting a feline in their life, Jackson Galaxy has one bit of information: Cats are not designed to please you. Feed them, make them comfortable, and they'll be your friend. It's about making them happy, and not yourself. "The frustration comes from (guardians) communicating with the needs of the cat and being in a relationship with a cat, which is a very different beast than a relationship with a dog," says Galaxy, the famous cat whisperer, or "Cat Daddy," who hosts the popular Animal Planet show "My Cat From Hell." Galaxy stops in Portland on Friday, Nov. 30, at the Crystal Ballroom on his national tour, "Total Cat Mojo Live." It's a one-man show — without cats on stage — as he educates and entertains about domesticated cats. "As I talk about in my show, we co-evolved with dogs over hundreds of years. We 'get' them in a basic way, but we're frustrated when (cats) act out and project many things on them," he says. "I get frustrated more with humans. Animals don't make excuses, and much of the time is spent (by humans) wiggling out of tough times and not committing." It's the hardest thing for a cat guardian to understand, he adds: "It's a big admission that cats are not dogs. In genetically, historically and evolutionary ways, (cats) are not here to please us, it's not in their genes. They don't give a hoot about making us happy the way dogs are motivated to do. You have to speak to what motivates them, and that's approval, that's food." Cat happiness also has to do with environment, and "creating lanes of traffic, and they extend from the floor to the ceiling, and giving them places to own." In "My Cat From Hell," currently airing for the 10th season on Saturday nights, Galaxy works with cat guardians and their misbehaving cats, and on their prickly miscommunication and hairy relationship. One of his most famous clients was a Portland family that had a cat (Lux) that literally trapped them in a bathroom. It's called the "911 cat," because the family ended up calling 911 for help getting out of the bathroom. Galaxy visited Portland and worked on the relationship. The fifth season had just wrapped, and he got the call about the family and its pet the next day. It turned into an hour episode. "In real life, (the conflict and therapy) went on for a year," he says. "There was an ongoing series of successes and failures and setbacks and devastations, and people going to the hospital." Galaxy says that making cats happy is about providing food and a comfortable environment. Satisfying a cat is one thing, but making two or more of them happy and getting along is another. "Cat mojo equals ownership of territory and having something in that territory that speaks to their basic needs," Galaxy says. "It allows them to know they're not being challenged. "Like a house where things are not all rosy, it's about backing up and starting from scratch, introducing them in a detailed way, changing the remaining negatives into positive ones. ... In my book, it's a 25-page chunk (of info on the subject)." Galaxy covers a lot of his ways with cats in his four books, the latest being "Total Cat Mojo, The Ultimate Guide to Life With Your Cat." Along with "My Cat From Hell," he has starred in another Animal Planet show, "Cat vs. Dog." Galaxy, an animal advocate and wellness consultant, also likes dogs. He has three dogs to go with seven cats, including two kittens, not including a few feral cats inhabitating a catio at home. Oh, he also has a box turtle. He has been enjoying doing "Total Cat Mojo Live." He educates and entertains with cat videos and music. "It's all me. It's a story about my journey learning with these cats." He adds: "It's so gratifying. TV is sort of a hermetically sealed chamber. Every day you're going into someone's house and concentrating on one thing. I say to the (live) crowd, 'This is the cat equivalent of a dog park.'" 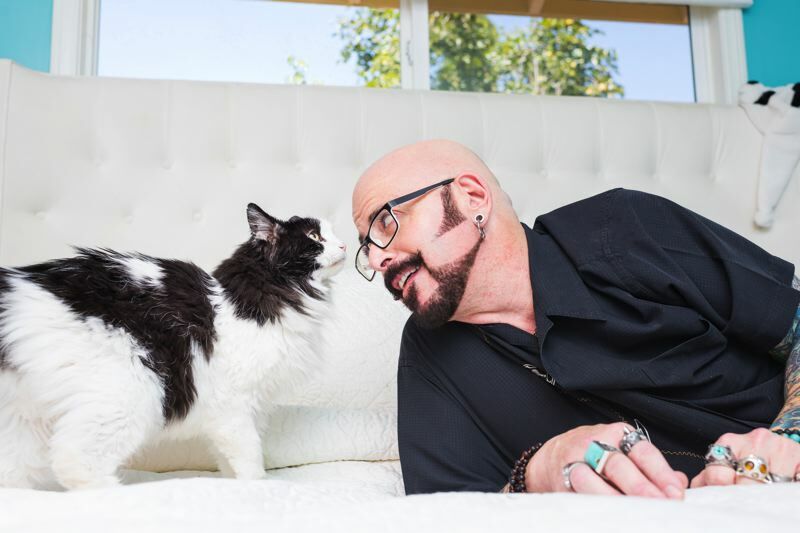 Tickets for Jackson Galaxy's "Total Cat Mojo Live" are $43.50 for general admission and $59.50 for premium seating. The show is at 7 p.m. Friday, Nov. 30, at the Crystal Ballroom, 1332 W. Burnside St. For more: www.crystalballroompdx.com.